HONOLULU – Retired U.S. Navy Captain Thomas Travis has been appointed to serve as Administrator of the Hawaii Emergency Management Agency (HI-EMA). A former national security analyst and the contributing author and senior editor of foundational studies on Operation Iraqi Freedom and the U.S. Government response to Hurricane Katrina, Travis replaces Interim Administrator Brigadier General Moses Kaoiwi Jr. Today is his first official day in the position. Brig. Gen Kaoiwi will remain in his role of Interim Administrator to ensure a smooth transition. A graduate of the U.S. Naval Academy, Travis most recently resided in Tucson, Arizona, but has previous ties to Hawaii, having lived in Kapoho on the Island of Hawaii from 2011 to 2016. He also served on various submarines at Pearl Harbor from 1977 to 1991. After retiring from the U.S. Navy, Travis worked as an Assistant Director at the Joint Advanced Warfighting Program, Institute for Defense Analyses and most recently as the Studies Director, Joint Center for Operational Analysis, U.S. Joint Staff. 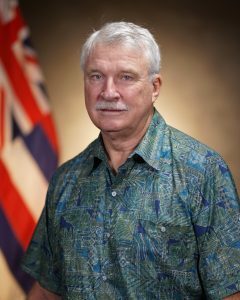 Travis was selected from a pool of ten candidates to head the Hawaii Emergency Management Agency, one of six divisions and offices within the State of Hawaii, Department of Defense.